The fall season always brings such enticing events to the Capital Region, and this weekend is no exception. Check out food festivals in Saratoga and Troy, a beverage event in Albany, and other fun happenings, including some right here in Clifton Park! How would you like to try a wide array of cultural foods for just $1 per sample? 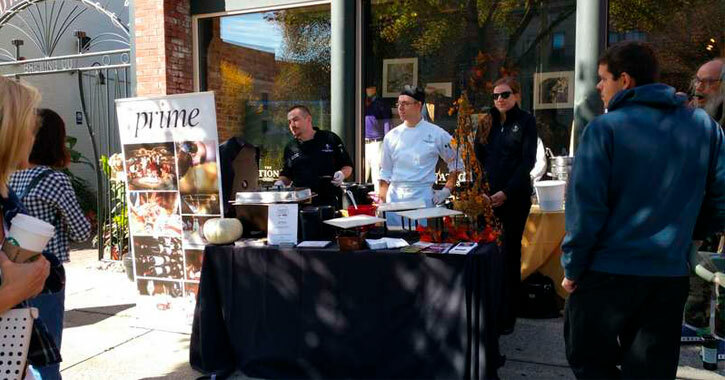 Head to the annual Saratoga International Flavorfeast on Saturday! You pick up a Flavorfeast “passport-map” with participating restaurants upon arrival and then head out on your culinary adventure. Over 15,000 chowder lovers are expected to be in attendance at the Troy Chowderfest. Chowder samples are $1 and types of chowder range from a buffalo chicken chowder to a Manhattan clam chowder and anything in between. Drink Albany is taking place once again at the New York State Museum. There is a long list of exciting producers participating and tickets are $35. There will also be cool vendors on site, like Dutch Udder Craft Ice Cream and Collar City Candle. Ready for a different kind of Oktoberfest? Muzapalooza is a Polish version of the traditional October celebration. Enjoy live music, festive food, and of course, beer at The Hill at Muza in Troy. Ballston Spa United Methodist Church is hosting its Falling Leaves 5K Run this Saturday. The cost to run is $25 in advance or $30 the day of the event, and proceeds benefit the Veterans & Community Housing Coalition of Ballston Spa. The annual The Way We Were Car show is happening right on Front Street in Ballston Spa. Come out to see hundreds of cars and trucks on display and enjoy live music, vendors, and downtown businesses. Haunted Saratoga Ghost Tours take place on Fridays and Saturdays through November 4th and they involve a 90-minute walking tour through Saratoga. Learn about the spirits that dwell in the Spa City and find out more about local history. The cost is $20. See the beautiful Yaddo Gardens in Saratoga in a whole new light with this guided ghost tour. Tours last one hour and the cost is $10. Tours are happening on Fridays and Sundays throughout October. Schuyler Farms in Schuylerville has a corn maze that is crawling with spooky creatures come nighttime. The cost to go through the haunted maze is $14, and they’ll have fun farm activities going on during the day before night falls. The Town of Clifton Park Open Space, Trails & Riverfront Committee is hosting a guided walk that will involve the evaluation of site conditions at Veterans Memorial Park and Mooney Carrese Forest. Enjoy outdoor activities before the cold weather sets in! Have kids between 12 and 36 months old? Stop by the Clifton Park-Halfmoon Library on Friday morning for playtime with age appropriate toys, books, and puzzles. After Playtime local author and entertainer Chuck Oakes will be speaking about challenges families face with aging loved ones. It may not be as thrilling as a food festival, but shredding documents is a pain and Clifton Park’s Town Paper Shredding Day makes this a bit easier. Protect your information and get those documents shredded – for free! This is for Clifton Park residents only, and there is a limit of four huge bags or boxes. Next Article From Festivals to 5Ks & More – It’s Going to be a Great Weekend in the Capital Region!